A new version of Firefox for iOS is out with some nice additions if you're running a newer device. Three months after Firefox for iOS exited beta, Mozilla is adding more features to the mobile browser with the release of Firefox for iOS 2.0. The highlights of the new version include 3D Touch features, Spotlight search support, and an actual password manager. The impact on you at home: Many of the new features aren’t going to be of much use to anyone on older iPhones. Unless you’ve upgraded to the latest and greatest version of iOS or have a newer device, the major features are out of reach—although the addition of a better password manager and the “find in page” features are nice additions for any device capable of running Firefox 2.0 (iOS 8.2 and up). Tops on the list of new features is 3D Touch support for the iPhone 6s and 6s Plus. Firefox for iOS 2.0 features 3D Touch support. Long pressing the Firefox icon on the home screen reveals options to open your last-used bookmark, a new private tab, or a regular tab. The new 3D Touch integration also supports Peek and Pop. This allows you to get at a variety of options quickly, such as Add to Reading List and Send to Device. The initial release of Firefox for iOS only allowed you to save your password/login information. With Firefox 2.0, Mozilla has added more password management functionality to the mobile browser, allowing you to view, edit, and delete your saved logins. Firefox 2.0 supports Spotlight Search. 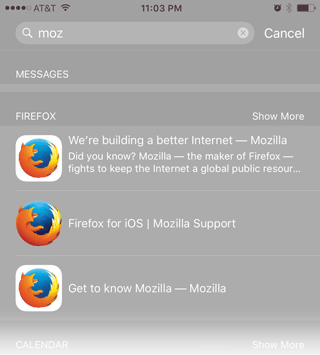 Firefox 2.0 now works with Spotlight Search in iOS 9 so that you can find content from your open tabs at the system level. There’s also a new “find in page” functionality allowing you to search the content of a tab for a specific word or phrase.